Sprint gets BlackBerry Pearl 8130 in Q4 | BlackBerry Blast! 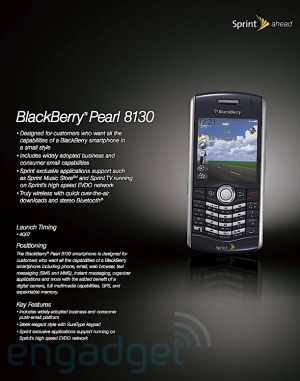 Sprint will apparently offer the BlackBerry Pearl 8130 during the fourth quarter of 2007. engadget mobile has published a copy of Sprint's Q4 Roadmap which includes the BlackBerry Pearl. (It is about time Sprint offered the 8130.) According to the roadmap the BB 8130 will support the Sprint Music Store and Sprints TV service, as well as EVDO.